When it comes to restoring Northwest rivers, environmentalists are turning to a somewhat surprising approach: tree-cutting. 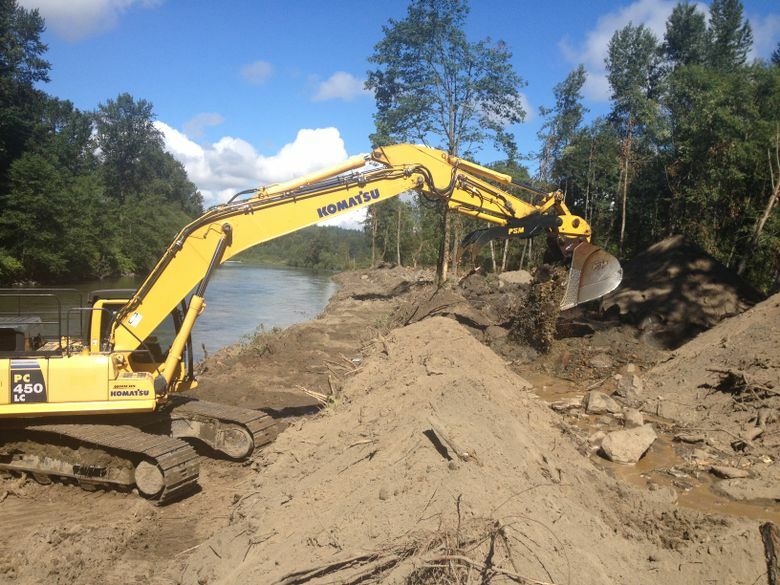 That was the first step in a project near Fall City where crews dropped some 300 trees on the bank of the Snoqualmie River and then ripped out 1,600 feet of levee, rock by rock. The denuded river bank was reunited last summer with a notoriously hungry river. The tree-cutting and earthwork represent a new chapter in reconnecting rivers with their natural flood plains. 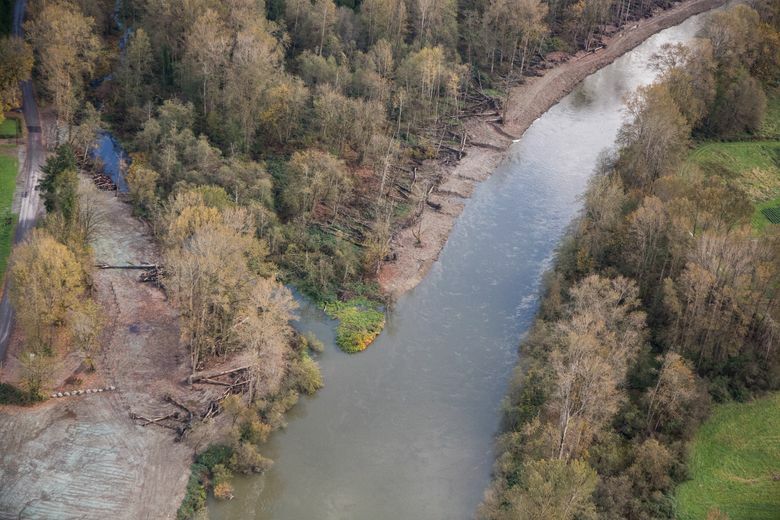 Championed by the Nature Conservancy and the Puget Sound Partnership, flood-plain restoration has grown into a multimillion-dollar statewide campaign. The program’s early success has county officials, tribes, farmers and environmentalists asking the Legislature to fund dozens of flood-plain projects, and it should. The state House heard the message and added $43 million in its capital budget. The state Senate, however, is still dancing around the issue and has yet to fund the program, despite that it helps protect lives, property and restore salmon habitat. The question is: How can Senate budget leaders afford not to make such an investment? When Mike Stevens of the Nature Conservancy, Washington, first explained “Floodplains by Design,” I admit I was skeptical. Why tear up nature to fix it? But ignorance is at the root of a lot of skepticism. As we peer into an uncertain future of warmer temperatures and heavier winter rain, it’s clear some levees should come out and flood plains be re-established. It’s the kind of forward-thinking investment we expect of state leaders. The completion of the Fall City project brought several dozen state and county managers to the muddy banks of the river earlier this month. Fred Jarrett, deputy King County executive, in suit and wingtips, was there alongside fleece-wearing Angela Wymer of the Snoqualmie Tribe. In her native language, Wymer offered a blessing to the river. Jarrett spoke of the necessity of all like-minded groups to join forces and tackle these costly, complex environmental projects that offer multiple benefits. Those who engineered and built the new $3.5 million project described how they scooped out the 1930s-era levee. It was the kind of stone-hardened berm found on countless Northwest rivers — a vestige of the belief that we can tame what cannot be tamed. Once out, the river widened and natural gravel deposits have started to fill in as nature intended and salmon need. Crews felled giant cottonwoods and left them along the river bank, their root balls ready to snag woody debris to create future fish habitat. At the lower end of the 50-acre public site, an 850-foot-long “box of rocks” was sunk into loamy soil to protect homes and farmland. Four log jams were bundled by cable and partially buried to further blunt the river. At flood stage, the Snoqualmie can go “wall to wall” across the valley floor and, as if on cue, it flooded on Jan. 6. It was one of the river’s top 10 flooding events of the last 25 years. Milky water poured across the new flood plain, as intended, allowing the river to release some of its energy instead of surging across low spots. If there is any doubt about the value of such projects, lawmakers should talk to Joe Pestinger, mayor of Orting in Pierce County. By relocating 1.5 miles of old levee on the Puyallup River, the new flood plains spared the town from flooding this winter — twice. 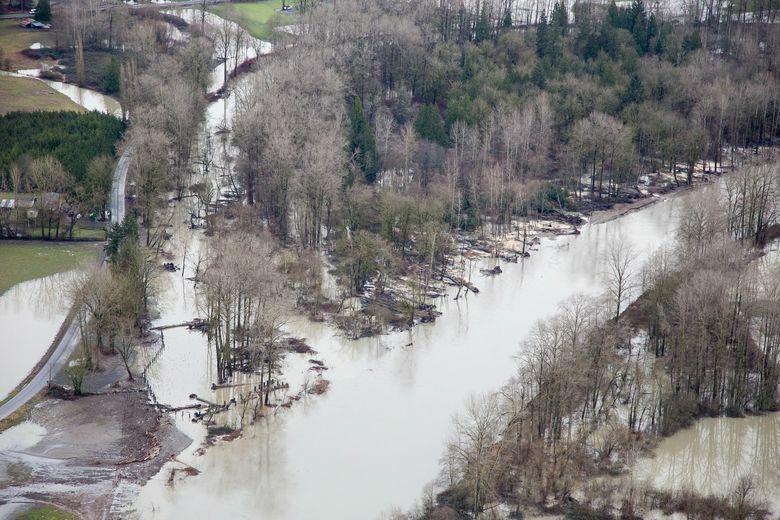 If Senate leaders are worried the state can’t afford this program, it might consider this: Puget Sound rivers have reached flood stage 1,400 times in the last 20 years. Long-range forecasts suggest heavy flooding may occur every three to five years in flood-prone counties. And so is learning to work with nature, instead of against it.